It's a humbling thing to see two children surviving the death of their father in the midst of the rubble of Iraq, in the full knowledge that his death was a direct result of the developed world's (read UK & USA) grab for oil. It's deeply moving to see the loss of a french glacier to climate change, and to hear the narrative of an 81 year old mountain guide who has lived there all his life. It's maddeningly frustrating to see the loss of a Devon wind farm application to local aesthetic fears (hey, what are motorways but a scar on our landscape? A scar that is creating part of the problem by carrying the very vehicles that are pumping damaging emissions. What an irony that we accept motorway expansion with so little fight, unlike the wind farm applications). It's challenging to view the contradictions of the oil worker who believed himself to be an environmentalist. These and other stories are the stuff of The Age of Stupid, the new movie from 'McLibel' Director Franny Armstrong and the Producer of the Oscar-winning 'One Day In September', John Battsek. Oscar-nominated Pete Postlethwaite (In The Name of the Father, Brassed Off, Usual Suspects) stars as an old man living in the devastated world of 2055. He watches 'archive' footage from 2008 and asks: Why didn't we stop climate change when we had the chance? There were few dry eyes at the end of the All Party Parliamentary Climate Change Group sceening at Portcullis House yesterday afternoon. Such was the impact on an audience consisting of hardened environmentalists, seasoned campaigners and (a smattering of) concerned MP's. The Q&A session afterwards elicited some insightful responses. Colin Challen MP called for everyone to join the "Militant Green Tendency and go agitate your party of choice at every meeting you can until Climate Change is top of the political agenda". Franny Armstrong, the director, asserted that the only way forward is for there to be strong international laws put in place (a timely reminder just as the crucial Climate Bill, the world-first climate change law, is making its way through parliament). Roger Higman of Friends of the Earth, when asked whether we had enough time to turn things around, stated that he was optimistic it could be done. On a scale of 1 - 10, he put his personal belief at a 9 - 10. And Peter Postlethwaite (who forsook his normal actor's fee and stayed with chums rather than incur additional costs during filming)? Good news there: he's finally got the go-ahead for his own turbine to be installed at his eco-home in Shropshire. Later in conversation with Mark Lynas over a pint, we nattered on the rapid evolution of knowledge on climate change. Even with a film that flags up best understanding on climate change at the beginning of 2008 (with Mark filmed in his garden shed - clearly the hub of much activity - succinctly explaining why 2 degrees is such an important figure), scientific understanding has already moved forward and the framing of the issues has shifted (see the controversial Kyoto 2 book by Oliver Tickell, due to land in book stores next week). 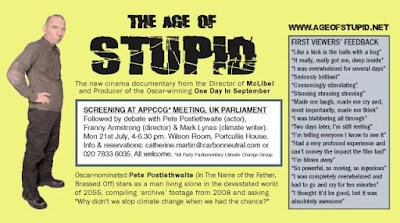 The concept of 60 - 80% reductions of greenhouse gases has now been superceded by the general scientific acceptance that, as Mark put it, to ensure we get within spitting distance of getting no further than a 2% degree increase of temperature (and all the attendant climactic conditions that will bring) will mean that we must bring our emissions to 350 parts per million. Our emissions already stand at about 385 parts per million. Thus, we have in effect already overshot. Quite simply we need to progress to a zero-carbon world as soon as possible. That's not to knock the important message that The Age of Stupid is presenting, as Mark was quick to point out. It's valid, vital and very very good.